To say the last couple of months have a frustrating would be a bit of an understatement. We are snowed under with really good enquiries so I’m particularly busy on the design front, but every time I do some work on one of these larger projects I seem to choose the one that then gets put back for whatever reason. I think in the last round up I mentioned some elm tops for Adam Zombory Moldovan (ZMMA) who i’m doing the Shaftesbury Common Places and Persimmon Homes projects with. He’s just opening an office in Shaftesbury as a satelite to the London office and wanted a big slab of beautiful wood as a meeting table / worksurface. 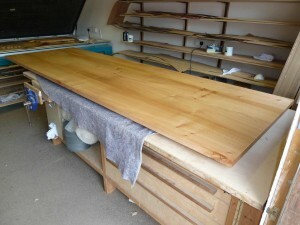 We both love elm and I managed to source some lovely stuff at over 5 metres long for this. We made two tops, the main one is 3 metres long, the other a metre shorter. They will look fab once in. As always finding it was a challenge, then working around all the faults. There is never as much as you’d like and compromises have to be made, but Adam seems over the moon with them and has found some lovely old cast iron trestles to sit them on. I took some convincing on this but actually they do look cool a very minimal, achieving that ‘floating’ look he wanted. 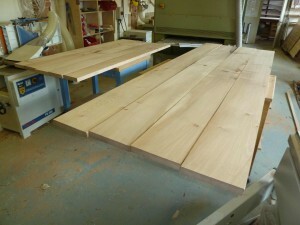 Next through has been a very simple but stylish table frame for a large glass top table. This is another job through Carter Shott, the London interior designers, and as ever they seem to have great ideas and a real eye for detail, without going over the top. 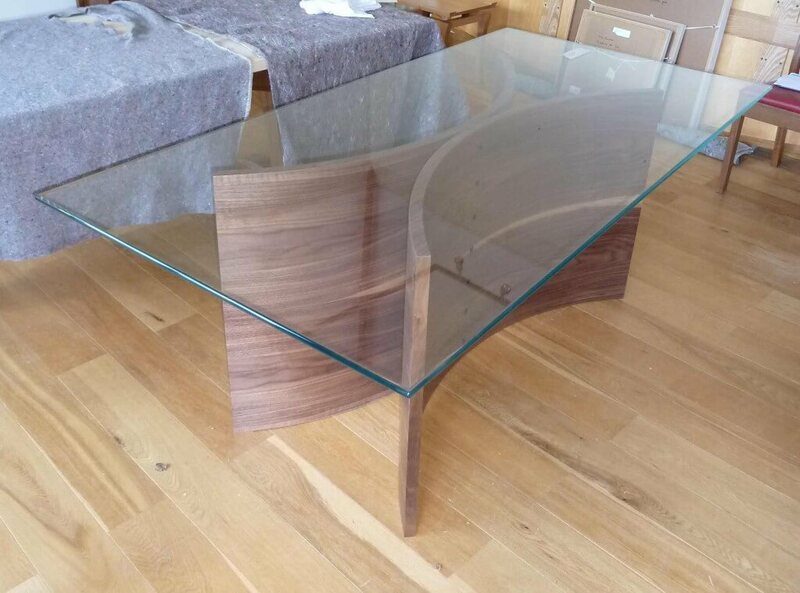 The frame is effectively 2 curved panels in walnut stuck back to back with a ‘stitch’ detail running down the join. We used a low iron 15mm glass which is less green in colour. Looked great but none of us are looking forward to getting up 3 floors of stairs! During Purbeck Art Weeks we had various existing clients come back to us for new work. One of these jobs has just been completed and we are very pleased with it, partly because we just enjoy working for them, and partly because it was such an interesting job with some new finishes. 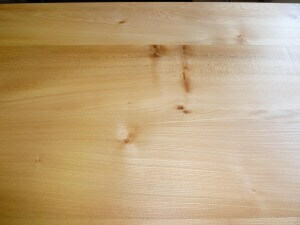 Last year we played around with bleaching ash and had great results on the ‘Banquet Table’, so we thought we would try it out on this bedroom furniture. 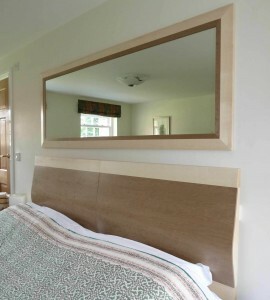 We combined it with some more tabu coloured birds eye maple veneers, this time a subtle olive green. The results are really stunning and a bit of a change from ‘woody’ palette we are used to. Perhaps we just aren’t afraid of colour any more. 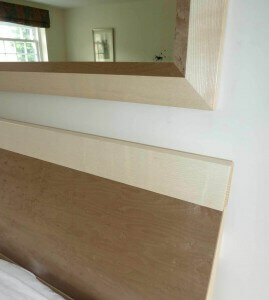 So we made a pair of bedheads and a mirror to hang over the top. They are now talking about new bedside tables so this may run and run. July is looking interesting, me and the wife are expecting our second baby – no we don’t what it is, and on top of that John is getting married to Emily. It’s going to be a busy month, but not here in the workshop. We’ve planned an Italian style shutdown for a few weeks, so everyone is having a break.